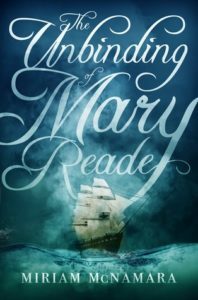 While The Unbinding of Mary Reade wasn’t what I was expecting, it surprised me with it’s diversity and depth. If you are expecting a pirate adventure that is non-stop adventure – then this might not be for you. Don’t get me wrong, there’s action scenes and killing abound – but what truly lies at the heart of this story is more of a romance plot line. That didn’t mean I hated it, but it just wasn’t what I was expecting. Moving on to the review, because there was more of an emphasis on romantic elements, the characters were particularly important – and none as important as Mary. (Is it wrong I didn’t really like many of the other characters? We’re all entitled to our own opinion!) Mary was a fascinating character not only because she is bisexual, but she is also questioning this sort of gender fluid identity (as someone who isn’t part of either of this group, I cannot speak to the accuracy of these). But she’s not only reduced to her diversity, she’s also an intriguing character because, in many ways, she’s beyond her time. This is still the time in period where homosexuality is executionable. McNamara does a great job at showing us that Mary is struggling with trying to figure out who she is, in a culture that would actually kill her for it. In this very similar note, I enjoyed that McNamara also introduced a female pirate, who does not pass. They have some interesting conversations about the differences in their experiences, the specific challenges they have as someone who is ‘passing’ and as someone who is defined by her gender. And writing wise, there’s two different timelines in the book – the past and the present. The past deals with Mary’s history, why she becomes a pirate, and her desire to get to Nassou. In the present we unfold her journeys and the new relationships she forms. This unique dynamic helps reveal the intricacies of Mary’s character and internal dilemmas. Books that unfold like this are truly some of my favorite, and I was really happy with how McNamara writes this! Was this not what I was expecting? Nope, but did I enjoy it nonetheless? Most certainly. Be sure to check out The Unbinding of Mary Reade on Goodreads. Do you think I’ll enjoy this? I’m super into the whole pirate/ships thing since reading The Company of Eight, but as you know I’m not huge on romance books..
Hm, I’d maybe skip it! Have you read The Girl From Everywhere? I really loved that one!